Human love, though delightful, is flawed, weak, imperfect. Human love grasps at perfection but never makes the cut. God’s love, however, is perfection entirely. God’s love changes a person’s life, and does something amazing. It expels it entirely as we lift it, weak-kneed, to him. Satan throws doubt and accusations at us, but God’s love repels all of it. God’s love is our armour when the spears of fear are thrown. God’s love is our comfort when we just can’t take another insult. God’s love is our warm blanket when the world seems cold and angry. God’s love is our hope and testimony when all else seems uncertain. God’s love expels all fear as we open our arms to him – our amazing father and very best friend. Jesus, may I know your love, deeply, and allow your perfect love to drive out every single one of my fears so I can walk in true freedom. I was just thinking of this verse this morning. 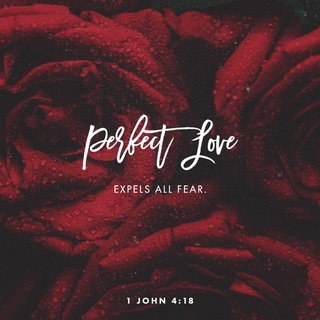 God’s perfect love also loves perfectly in all situations – so we need not fear his decisions nor assume his decreases are ever based upon punishment, when we willingly desire his rule. He is amazing! Thank you for this most encouraging post! God bless! Amen to that. He is amazing and his love applies at all times!